Scorching temps and hot treasure. The heat wave has turned the Atlanta area into a sauna. You can't walk 5 feet outside without turning into a glistening, sweaty mess. Still, nothing was going to keep me from a bit of treasure hunting. Vintage Village had posted pictures of items in the shop this week and I had to go pick up the two I asked the them to hold for me. Always fun to visit as I find great pieces and visit with friends. I shot this when I first walked into the shop. Really like the simplicity of this arrangement; the brown and grey hues work so well together. How delightful. Haven't seen Pin Money banks in decades. The origin of this term hails from the time of Henry VIII. Catharine Howard, wife of Henry VIII., introduced pins into England from France. As they were expensive at first, a separate sum for this luxury was granted to the ladies by their husbands. Hence the expression "pin-money." Ladies in the 1950s would save their pennies in a Pin Money bank. Crazy about this seafoam green painted buffet. Getting ready to celebrate the 4th of July at Vintage Village. Love these painted bottles. Great idea for a wedding table. More painted vases and decorated with flowers. Such a great idea to repurpose old, glass vases. What a clever use of gameboards. Cover a blank wall with them. They are colorful and set the tone for a good time. Purchased this marvelous Eastlake chair with original wood finish and patina. Nice re upholstery by previous owner. Gorgeous quadruple plated, Victorian server. Lots of original silver and pretty little handles. Saw this sweet little child's chair on their facebook page and had to have it. It's now in my foyer on a bucket bench. Couldn't resist this great vintage Pinocchio hat. Brilliant red felt, it was really wrinkled and squashed. I soaked it in cold water and then put on a form to reset. Added vintage plum as the original one was missing and now it is ready for a collector. Adore these military souvenirs that sons purchased for their parents and girlfriends. Nice WW2 piece. Found this pair of late Victorian quad plate serving trays at a local haunt and then the gorgeous blue stone dress clip and antique photograph of a man in drag at Vintage Village. One of the treasures I purchased was a scrap book album from 1926. It was filled with other cool photos too. Lots of flappers and love notes as well. Now, one of the reasons I had to make a fun run to VV. This marvelous, early 1900s tin cake carrier. Love, Love, Love the simplistic lines of this primitive looking carrier. Can't wait to use it over the winter holidays for some of my best baked offerings. Found these vintage and very chippy wooden candlesticks at my local Goodwill. These are great decorative pieces for holiday tables. Another Goodwill find...three Katherine's Collection at Silverlake fairies on pedestal balls. Not my thing, but very collectible and they appear to have a big following. And the last item I found at Goodwill...yup, it is a Lenox 1994 bisque figurine called Footprints in the Sand. Books at $150.00 on the secondary market. Will pass it along at a good price as I paid pennies for it. Nice, silverplated gravy boat trophy. Runner up, tennis singles trophy. 1950. White washed wooden crate has so many decorative uses. Lastly, a gorgeous lamp base. Satin glass bottom with hand painted flowers. This is a huge lamp and once I find a globe for the top half, I will take to the store. Love the look of this piece. Life sometimes throws a curve ball at you and I have been handed one that I'm still trying to wrap my arms around. I never want to use the blog as a crying towel because I cherish all who visit. 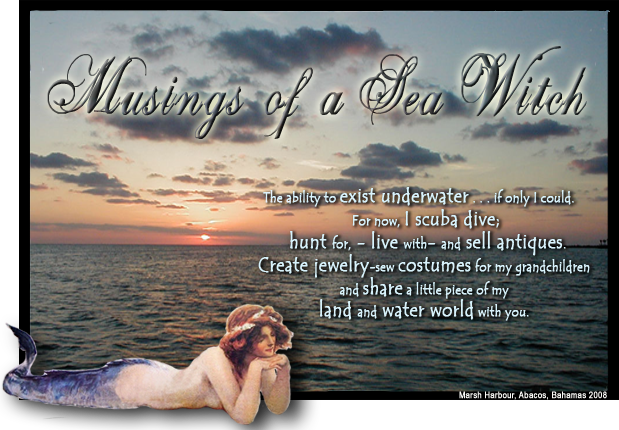 I want this to be a gentle space where you can enjoy the hunt as much as I do, delight in the finds and hear the tales I spin. I appreciate those who visit and have counted so many of you as friends that I feel the need to unburden what I have been carrying for the last 11 days. I'll make it quick and then share a few finds as I do not want to dwell on the heavy. The doctors have discovered a cluster of spots on my honey's liver and he goes in for a biopsy tomorrow to determine if it is metastasis melanoma. I am frightened and even though the doctors say it may not be cancer, the waiting for results brings all of the fear and stress and sadness I went through with my mom's swift but losing battle with this ugly disease. As we learn of the results and prepare a plan of action, I may not be posting weekly for a while. Still, this blog brings me focus and at a time where I need some gentle time, I will be here. I found this sweet cupid on ebay last summer. His chubby little body and crying face has such a sweet emotion to it. It's called “Cupids Dilemma” and is a chromolithograph print in original fame with vintage glass. Chromolithography, the first true multi-color printing method as previously color had been applied by hand. The Victorians loved this method of printing because of its rich coloring; many children's books included this printing type. Print is dated Dec 4th, 1892. Found this Victorian calling card receiving tray at my local goodwill on Saturday. Solid cast bronze metal has been spray painted white by a past owner. Circa 1890s. I like these lost use pieces and I have one that I display unique seashells on. Another goodwill find, a pretty flapper era celluloid brooch of the softest shades of pastels. Measures approximately 3 inches. 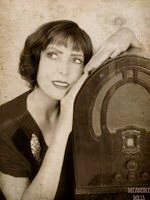 Circa 1920-30s. Sometimes you just find the most interesting things at a goodwill. I collect antique carnival glass when I can find pieces that I can afford. I especially gravitate towards the older pieces with their brilliant lustre "MATT" finishes. They have such fire and this lovely Dugan nappy, pattern: holly and berries, I found at the Buford Queen of Hearts this weekend. I got it on the cheap because this piece has a perfectly lined clean break that has been reglued so well that you don't see the repair unless you hold it up to the light. I can't wait to display this piece over the future Christmas holidays. Yard sale find! Yes, I said yard sale find. I don't usually stop at those round my neck of the woods as they are mostly baby clothes and toys but this was near my home and it was late in the day. I asked if they had any granny jewelry or broken items and she trotted out this set. Lovely early 19th century demi parue necklace, earrings and brooch. Braided mesh, gold washed chain and settings with jade cabochon stones, natural pearls and amethyst teardrop gemstones. Closeup of earrings, clips. I'm still doing a little research on their age and perhaps maker. There are no hallmarks but this is such a lovely set it I hope to identify the manufacturer. If I learn anything about it I will post on a future blog. Last my not least, I saw this print at Queen of Hearts and it reminded me of my cyber friend, Mitzi from Mitzi's Miscellany. She is like a walking encyclopedia or in today's vernacular, an antique fact wikipedia of information. Her blog is as delightful as she is and she always takes the coolest vintage photos of herself. A true lover of time periods, I know when she sees this print she will understand why I thought of her. Yup, it's the eyes. This is most definitely you, Mitzi. This was a long weekend for the SeaWitch. Got some disheartening news that I'm not ready to share yet. Will know more later this week and I'm praying that it will be better than what was first found. My honey insisted that since there is nothing we can do until more testing is done, I should go about my day as I normally would. So off to a few favorite haunts and the treasure that I found. Found this marvelous three piece set of a huge teapot, coffeepot and sugarbowl at a local thrift store. Heavy and beautifully silverplated from the Portsmouth Silver Co. These pieces look like they were hidden in a cupboard and never used. You know me and quadruple plate. I just can't walk away from it. Pretty matching sugarbowl and creamer. About a month ago, I found a set of 8 dinner plates in the same brilliant marigold carnival glass color. Sold them a week after putting them in my booth. Found this pair of Federal Normandie Bouquet Lattice pattern, marigold Carnival Glass grill dinner plates. Lovely pair of silverplated serving trays. One is mid century and the other is a late Victorian quadruple plated piece. Both are in marvelous condition. Lovely french engraving of roses and a pastoral scene in vintage frame. Pretty handpainted tole roses on metal magazine rack. Very 1950s. Great pair of early 20th century lamps in cast pot metal on black marble bases with cut crystals. Both work and I will add the missing prisms to it and a pair of period lampshades to complete them. And last, but not least, my new "bestie". Marvelous vintage wicker store display manniquen is pure delight. Haven't decided if I will keep her or sell her. I attended my first auction in Georgia since moving here in July 2000. That means I've gone auctionless for 13 years. I used to hit auctions every weekend when I lived in the MidWest and out West and they were terrific for finding great antiques and chippy items. Especially, the farm auctions, they will always be my favorite. You don't find farm auctions in the Atlanta area and I've never been a fan of auction houses as they offer a hodge podge of stuff and most of it not the age I look for. This auction is located in my town and in keeping with my devotion to local businesses, I thought would give it a try. Well I had a great time and even though it was run a little different from the way I am used to, I managed to snag some great pieces.The offerings were from an Alabama estate that its original owners collected hundreds of exquisite antique/vintage lamps and oil lamps. I have never seen so many miniature oil lamps in one location. They had plat after plat full of them and lots of miscellaneous shades and crystals. My first winning bid, which was for $5.00, were for four antique etched shades. All have a lovely opalescent sheen to them similar to Steuben glass. I am always looking for shades like this as I come across period floor lamps without the shades. As I watched items come up I was hoping that this was an indication of good things to come. Second winning bid was for this marvelous, early 20th century black marble pen set with pen holder. Nice, big fluffy Victorian ostrich feather is a great pen shaft. This auction had a mixed bag of items but mostly gorgeous period furniture and lighting. If I had a much larger space I would have bid of some of the larger pieces of furniture. A delightful pair of faux Florentine stacking tables. These beauties are from the 1970s and are plastic. Until you pick them up you don't realize that they are plastic and the beauty is that you can take them outside with you on your patio, porch or deck. No need to worry about this aging in the weather like its wooden cousins. A spectacular converted to electric oil lamp with the palest blue, handpainted shade. Beautiful hanging crystal prisms and original brass, the electric was placed so it can be easily converted back to an oil lamp. Beautiful Victorian piece. Circa 1890s. I was delighted to see a tone on tone piano shawl with the sought after 14 inch silk fringe. Lucky me, I was the winning bidder of this beautiful antique silk embroidered wedding/piano shawl dates from the 1920s. Ivory silk with ivory silk hand embroidery and the long, long silk fringe. Very Great Gatsby/Roaring Twenties. I wonder how much bathtub gin this beauty has seen. 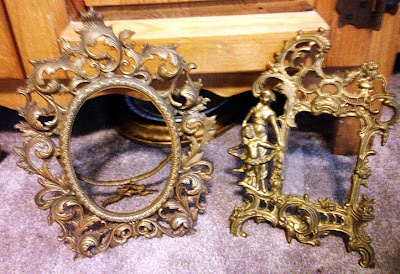 A pair of big, heavy cast bronze Victorian picture frames. I have a fondness for these and was delighted to win this bid. Following the auction, I made a quick run to my local Goodwill to drop off some items and then see what was brought in by others. Nice silverplated punch bowl ladle. Always a popular seller and this one is in beautiful condition. A gorgeous vintage wedding gown with a capital train. The gown's fabric is heavy satin embroidered cutwork with beaded pearls and sequins. A size 16, this beauty can easily be tailored to fit most women today or the yards of fabric can be used in so many decorative elements. Sweet little vintage, ironstone cream pitcher. A bag full of beautifully turned honey dippers. The wood is beautiful and make such pretty decorative elements. And last but not least...that item that I was jonesing for from "The Vintage Styled Life" store in Duluth. I don't usually indulge myself in items like this, but I have never come across a Victorian "castle-top" calling card case. As my business name says...I Need This, Antiques. I went back to Davina's lovely shop and purchased it. Silver "castle-top" card cases, showing architectural views, were popular in England in the first half of the 19th century. This one is American by the Philadelphia company Leonard & Wilson, c. 1840s-50s. The goddess Hebe serving ambrosia to Zeus in the shape of am eagle is in heavy repousse on the front with the Trinity Church on the other side. Pattern was first made c. 1846, when the church's new building was consecrated. For many years it was the tallest building in the New York city.